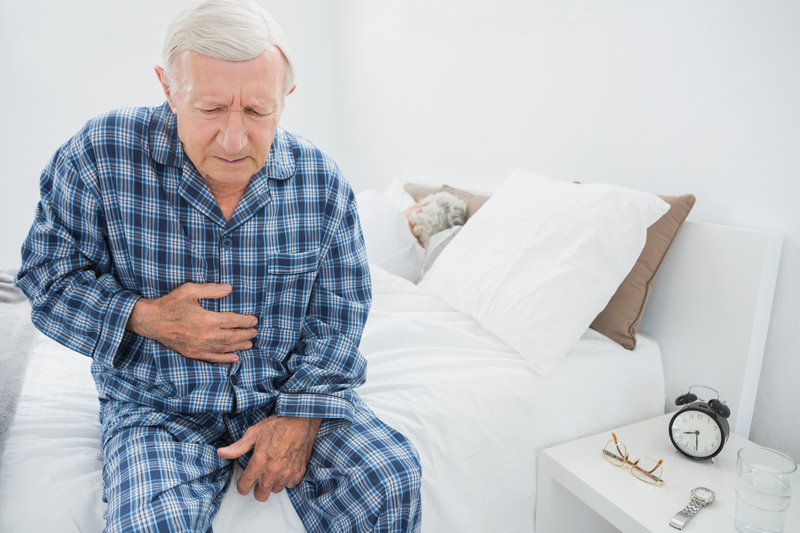 (PantherMedia / Wavebreakmedia ltd) Many people have heartburn every now and again after eating a large meal, and will be familiar with the unpleasant burning feeling in their chest, just behind their breastbone. Occasional acid reflux is normal too. Up to 20 out of 100 people living in Western countries regularly have problems like heartburn or regurgitation. Although both of these can be unpleasant, they don't usually lead to other health problems. But if you have very frequent or severe heartburn and often have acid reflux, you may have what is known as “gastro-esophageal reflux disease,” or GERD for short. The word "gastro-esophageal" means that the stomach and food pipe (esophagus) are affected. The passage between the food pipe and stomach is closed most of the time. It only opens when the mixture of chewed food and saliva reaches it. It closes again once the food has entered the stomach. This ensures that the contents of the stomach don't flow back. If the stomach is stretched a lot – for instance after a large meal – the sphincter (circular muscle) at the entrance to the stomach might temporarily loosen. Gas or stomach contents might leak up into the food pipe as a result. The sphincter may also sometimes open for no apparent reason. The digestive fluid in the stomach contents irritates the lining of the food pipe, and that is felt as heartburn. If stomach juices stay on the lining of the food pipe for some time, the food pipe might become inflamed and painful. In some people, stomach contents regularly leak into their food pipe, or a relatively large amount leaks out. It is considered to be GERD if this causes frequent or severe heartburn or acid reflux that affects your quality of life, or if your food pipe has become inflamed. Heartburn is felt as a burning pain that spreads from the upper stomach, or from the area behind the breastbone, up into the throat. As well as acid reflux and heartburn, GERD is sometimes associated with problems swallowing. Other possible symptoms include a burning sensation in your throat, a bad taste in your mouth, and stomach noises. People who have GERD often feel very full. They may also feel nauseous and like they need to vomit. Other possible symptoms include a dry cough, asthma, toothache, and a husky or hoarse voice. These occur if the stomach juices get into the windpipe and irritate the airways, or get into the mouth and attack the teeth. The food pipe becomes narrower just before it reaches the stomach. This narrow part is normally kept shut by the muscles in the food pipe and diaphragm. But this doesn't work properly in GERD. It is often not clear why. In some people it is caused by a hiatal hernia (also known as a hiatus hernia). The diaphragm is a sheet of muscle that separates the chest and abdominal cavities from each other. The food pipe passes through a small hole in the diaphragm and enters the stomach just below it. In people who have a hiatal hernia, the upper part of the stomach pushes up through the hole in the diaphragm and into the chest cavity. As a result, the diaphragm can no longer help to close the entrance to the stomach. There is some debate about whether being overweight, smoking and drinking alcohol can affect the sphincter or the risk of reflux and heartburn. Many of those affected say that their symptoms are triggered or made worse by stress – or by certain foods or drinks. The symptoms may also get worse after physical activities or through certain positions, such as bending forward or lying down. Sometimes reflux symptoms and heartburn are caused by a problem with the food pipe. For instance, the food pipe might not move rising stomach juices back down into the stomach fast enough, or it might react very sensitively. The symptoms can also be made worse by medications such as birth control pills and certain drugs against high blood pressure. GERD is usually a chronic condition and is typically characterized by recurrent attacks. In other words, you may have a symptom-free phase for a while, followed by a phase with more severe symptoms, followed by another symptom-free phase, and so on. The food pipe doesn't always become inflamed. In up to 2 out of 3 people with reflux symptoms, the membranes lining the food pipe are normal. A lot of people who have reflux and heartburn worry about the possible health consequences. But it usually doesn't get worse. Sometimes reflux can lead to changes in the mucous membranes lining the lower end of the food pipe. This is known as “Barrett’s esophagus.” It is estimated that 5 out of 100 people who have reflux will develop this condition after some time. 10 out of 1,000 people who do have Barrett’s esophagus. Another possible complication is esophageal stricture, which is where the food pipe becomes narrower. This happens if the food pipe is very inflamed and that leads to scarring. The scar tissue can make the entrance to the food pipe narrower and sometimes make it noticeably harder to swallow. GERD can usually be diagnosed based on typical symptoms. It is therefore important to describe your symptoms to your doctor in as much detail as possible, and tell him or her when and how often they occur. If someone is thought to have GERD, doctors sometimes suggest that they have a “trial treatment” known as a PPI test to see if they respond. The test involves taking proton pump inhibitors (PPIs) for about two weeks. If the medication relieves the symptoms, then it is very likely that GERD is causing them. People with severe heartburn or GERD can often relieve their symptoms by changing some of their lifestyle habits. For instance, they might try to avoid certain types of food, or drink less alcohol. This is not always easy to do, but it can be worth the effort. There are also medications that can relieve the symptoms. If this doesn't provide enough relief, surgery might be considered. Reflux and heartburn can be very distressing. The symptoms can affect your sleep and prevent you from enjoying food and drinks as much as you used to. GERD can affect your general wellbeing and everyday life. Some people stop participating in social activities and call in sick a lot. Although treatment isn't always pleasant and might take some time to work, a lot of people find that they feel better afterwards and that their GERD is no longer such a problem. Ip S, Chung M, Moorth D, Yu WW, Lee J, Chan JA et al. Comparative effectiveness of management strategies for gastroesophageal reflux disease: update. (AHRQ Comparative Effectiveness Reviews; Volume 29). Koop H, Fuchs KH, Labenz J, Lynen Jansen P, Messmann H, Miehlke S et al. Gastroösophageale Refluxkrankheit (S2k-Leitinie). AWMF-Registernr. : 021-013. May 2014.